Over the past several years I have been fortunate enough to work with some of the most incredible minds in coaching. When one of my mentors and personal coach, Craig Upton of Performance Labs Racing, told me to have a blood lactate test done I said yes sir. From my background I knew the implication of this testing and why he wanted the data. What I never thought about was actually using it with my own athletes. The traditional zone calculation methods as supported by guys like Friel and Coggan were so ingrained into the different training seminars I had been to I figured, well hell, these have to work, otherwise why would they be in books? 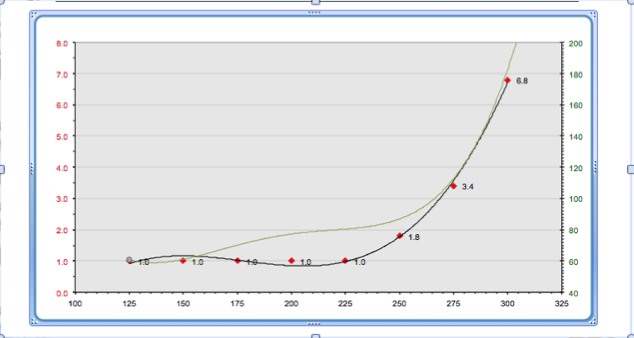 When I finally took a step back and looked at what Craig was actually evaluating in my lactate curve, I was blown away. Why had it taken me nearly 7 years to think about doing this sooner. Needless to say we started incorporating this testing into all of our athletes programs in 2014 and we now offer the testing to the public. When someone asks me about the test or why it is important, I get one of a few reactions. You’re just trying to make money off of me. If regular field testing doesn’t work how come everyone does it? This makes total sense, I am in 100%. Most of the time I get the last reaction because the athlete understands what we’re looking for and how you don’t have to bash your head against a wall every damn workout to get faster. I’m 100% confident in this method of testing and training because it WORKS if you know how to read the curve and how to apply the right training load. Let’s take a step back and look at something…here is a graph of 2 different guys who completed a Lactate Threshold Test using blood samples. What this means is that the Black Line athlete can utilize his aerobic system all the way up to 92% of his Anaerobic Threshold. This is they KEY in endurance training. Sure these guys can hang with each other for an hour but the guy with the green line has burnt through all of his carbohydrate stores and will feel awful while our hero with the black line is going to feel like he can keep going and even make a move to drop his competition. When we compare these wattages to the zones I calculated (like most do) above you’ll notice something. In the ‘endurance’ zone both of our guys would be riding between 152 watts and 206 watts. For the green line athlete that line’s up okay with where his aerobic range would be based on his curve (about 150-210 watts). This DOES NOT work so well with the black line athlete. He wouldn’t be working hard enough to get any aerobic development at that range . The black line athlete needs to ride at least 225 – 255 watts for his mitochondria to be stressed to the right level for development. If the black line athlete stuck with the traditional methodology it would be like lifting a one pound weight and hoping to build strength. It isn’t going to happen! The other thing I will say about the difference of these curves is that now, not only do we have know how these athlete create energy, we can also develop a specific training regimen to work on what each of them needs. The green line athlete needs more aerobic development. The black line athlete needs to work on pushing his lactate threshold out further to the right. Training these athletes should NOT look the same because they are NOT the same despite having the same threshold numbers! I hope now working through some numbers and by providing a specific example with real athletes you can recognize that if you’re not seeing results it is most likely the combination of incorrect training zones, a lack of understanding of the energy systems of the body, and/or sticking to a plan that leaves you bashing your head against a wall hoping you get faster. It’s really simple. It’s old science. It’s good science. It works. It doesn’t need to be more complicated than that!! !